Horovod is a distributed training framework for TensorFlow, Keras, PyTorch, and MXNet. The goal of Horovod is to make distributed Deep Learning fast and easy to use. 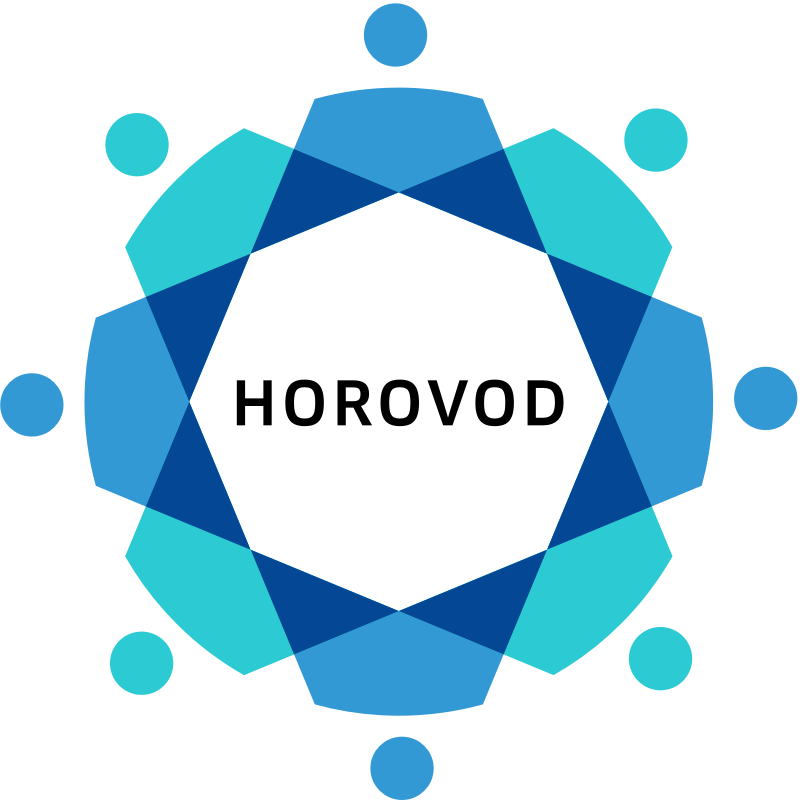 Horovod is hosted by the Linux Foundation Deep Learning (LF DL). If you are a company that is deeply committed to using open source technologies in artificial intelligence, machine and deep learning, and wanting to support the communities of open source projects in these domains, consider joining the LF Deep Learning Foundation. For details about who's involved and how Horovod plays a role, read the LF DL announcement. Why not traditional Distributed TensorFlow? How much modification does one have to make to a program to make it distributed, and how easy is it to run it. How much faster would it run in distributed mode? Internally at Uber we found the MPI model to be much more straightforward and require far less code changes than the Distributed TensorFlow with parameter servers. See the Usage section for more details. Horovod achieves 90% scaling efficiency for both Inception V3 and ResNet-101, and 68% scaling efficiency for VGG-16. See the Benchmarks page to find out how to reproduce these numbers. While installing MPI and NCCL itself may seem like an extra hassle, it only needs to be done once by the team dealing with infrastructure, while everyone else in the company who builds the models can enjoy the simplicity of training them at scale. Install Open MPI or another MPI implementation. Steps to install Open MPI are listed here. Note: Open MPI 3.1.3 has an issue that may cause hangs. It is recommended to downgrade to Open MPI 3.1.2 or upgrade to Open MPI 4.0.0. Install the horovod pip package. This basic installation is good for laptops and for getting to know Horovod. If you're installing Horovod on a server with GPUs, read the Horovod on GPU page. If you want to use Docker, read the Horovod in Docker page. Horovod core principles are based on MPI concepts such as size, rank, local rank, allreduce, allgather and broadcast. See here for more details. Pin a server GPU to be used by this process using config.gpu_options.visible_device_list. With the typical setup of one GPU per process, this can be set to local rank. In that case, the first process on the server will be allocated the first GPU, second process will be allocated the second GPU and so forth. Scale the learning rate by number of workers. Effective batch size in synchronous distributed training is scaled by the number of workers. An increase in learning rate compensates for the increased batch size. Wrap optimizer in hvd.DistributedOptimizer. The distributed optimizer delegates gradient computation to the original optimizer, averages gradients using allreduce or allgather, and then applies those averaged gradients. Add hvd.BroadcastGlobalVariablesHook(0) to broadcast initial variable states from rank 0 to all other processes. This is necessary to ensure consistent initialization of all workers when training is started with random weights or restored from a checkpoint. Alternatively, if you're not using MonitoredTrainingSession, you can simply execute the hvd.broadcast_global_variables op after global variables have been initialized. Modify your code to save checkpoints only on worker 0 to prevent other workers from corrupting them. This can be accomplished by passing checkpoint_dir=None to tf.train.MonitoredTrainingSession if hvd.rank() != 0. # Save checkpoints only on worker 0 to prevent other workers from corrupting them. # or an error occurs. The example commands below show how to run distributed training. See the Running Horovod page for more instructions, including RoCE/InfiniBand tweaks and tips for dealing with hangs. To run in Docker, see the Horovod in Docker page. To run in Kubernetes, see Kubeflow, MPI Operator, Helm Chart, and FfDL. To run in Spark, see the Spark page. Horovod supports Keras and regular TensorFlow in similar ways. See full training simple and advanced examples. Note: Keras 2.0.9 has a known issue that makes each worker allocate all GPUs on the server, instead of the GPU assigned by the local rank. If you have multiple GPUs per server, upgrade to Keras 2.1.2, or downgrade to Keras 2.0.8. Horovod supports Estimator API and regular TensorFlow in similar ways. See a full training example. Horovod supports MXNet and regular TensorFlow in similar ways. See full training MNIST and ImageNet examples. The script below provides a simple skeleton of code block based on MXNet Gluon API. Note: There is a known issue when running Horovod with MXNet on a Linux system with GCC version 5.X and above. We recommend users to build MXNet from source following this guide as a workaround for now. Horovod supports PyTorch and TensorFlow in similar ways. # Broadcast parameters from rank 0 to all other processes. Note: PyTorch support requires NCCL 2.2 or later. It also works with NCCL 2.1.15 if you are not using RoCE or InfiniBand. Horovod supports mixing and matching Horovod collectives with other MPI libraries, such as mpi4py, provided that the MPI was built with multi-threading support. You can check for MPI multi-threading support by querying the hvd.mpi_threads_supported() function. # Verify that MPI multi-threading is supported. Learn how to optimize your model for inference and remove Horovod operations from the graph here. One of the unique things about Horovod is its ability to interleave communication and computation coupled with the ability to batch small allreduce operations, which results in improved performance. We call this batching feature Tensor Fusion. See here for full details and tweaking instructions. Horovod has the ability to record the timeline of its activity, called Horovod Timeline. See here for full details and usage instructions. Run distributed training in Microsoft Azure using Batch AI and Horovod. See the Troubleshooting page and please submit the ticket if you can't find an answer. The Horovod source code was based off the Baidu tensorflow-allreduce repository written by Andrew Gibiansky and Joel Hestness. Their original work is described in the article Bringing HPC Techniques to Deep Learning.